We find this truly amazing... The new "giga" yachts. Megayachts and Superyachts just aren't enough anymore... to be truly outstanding, you now need a Gigayacht. Wally Yachts, based in Monaco, continues to develop innovative concepts and minimalist luxury their latest being the WallyIsland – a 99 meter (325 feet) "gigayacht". While Wally Island is not available at this time for charter, we thought you might find it interesting. What is the best way to get to the GRENADINES? Captain John Nicholson of MAKAYABELLA passes along this very helpful information for the easiest way to get to your charter yacht in the Grenadines. Fly to Barbados. There are many flights from the UK and USA. Charter a private plane for the 40 minute flight to any of the Grenadine Islands. A plane with 6 or 8 seats is approximately US$1,200 to $1,300 one way. Cost for a party of 6 is comparable to commercial flights. No connection worries. The chartered plane will wait if the international flight is delayed. Go straight through a transit lounge and on to the plane within 30 minutes of arriving. More flexible ports mean more time on the islands guests want to see . Example: Start in Bequia and return from Union. Customs and immigration are far quicker and easier than St. Vincent. For departure, check in 30 minutes before take-off - NOT 2 HOURS! Note: Guests must travel with carry-on luggage only. Makayabella will provide all the toiletry items that are no longer allowed on planes - just add it to the preferences. We'd like to thank Makayabella this tip! Makayabella is a 62-foot owner-operated sloop that accommodates up to 8 guests in 4 cabins, each with ensuite heads. Two cabins have double berths, while the other two guest cabins have twin bunks (upper/lower). Charter the yacht Ashlana (53-foot Little Harbor sloop) before May 15, 2008 in the British Virgin Islands and receive a 10% last minute discount. Owner/host Tom Hampson and Christie MacConnell have restored Ted Hood’s Little Harbor 53, Robin, to perfection, furnishing the interior with exquisite fabrics, original paintings and beveled glass front cabinets. Ashlana has accommodations for 4 four guests. The master cabin aft has 2 doubles berths with an ensuite head. And guests #3 and #4 may choose one of the two forward cabins: V berth with 2 lower singles & filler, or port cabin with upper/lower singles. The forward head is shared with the crew. Ashlana is available for charter in New England during the 2008 summer season. The elegant 85-foot Motor Yacht Eastern Star is now back on her dock in Chelsea Piers (New York) for the 2008 season and is ready for your charter. Good news for somebody! Take advantage of this popular week quickly! 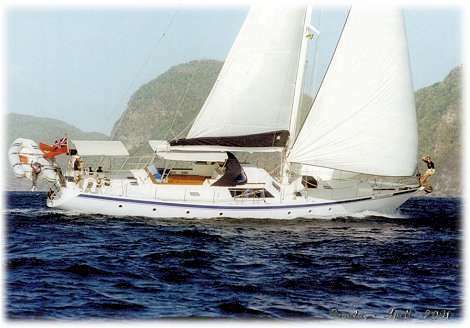 Due to a cancellation, our favorite sail / dive trimaran PROMENADE is now available for charter charter June 12-19 2008 (Fathers Day is June 15!). As noted in the post below, the yacht Promenade is fully booked through the middle of August 2008 so don't hestitate and miss out on this opportunity! We just received charter comments from a couple we had aboard the charter yacht BLU MOON in February 2008. Ben and I had a wonderful time on Blu Moon, we thought the BVI were fabulous and Chris and Julie were really great hosts. They keep an immaculate boat, and Chris is a very good captain, and Julie is a fantastic chef! They both really seem to enjoy what it is they do on the boat, and looked after us very well while we were there. Anything we wanted, it was never too much trouble. They know all the really great spots in the BVI as well, particularly quieter places where you don't get loads of boats. We had some really fun times, and they had plenty of interesting stories to tell us. One week was the perfect amount of time on the boat, and then we enjoyed a week in St Lucia, where we got engaged! So all in all, a great trip - so thanks for all your help Bob & Sheila, in finding us the right charter! 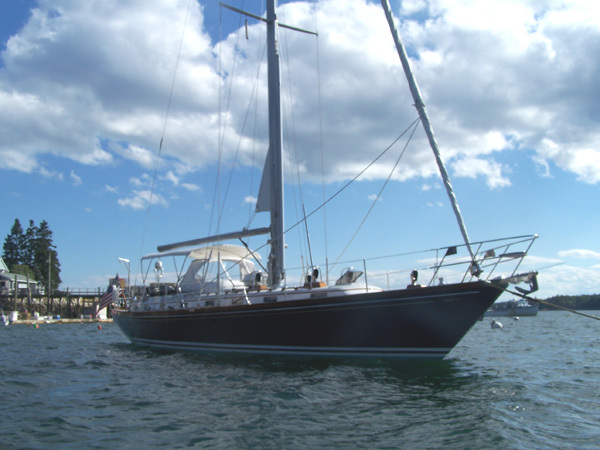 BLU MOON is a 50-foot Beneteau, owned and operated by Chris & Julie... an excellent team! BLU MOON still has a couple of weeks open this season... They are currently available for charter in the Virgin Islands April 27 through May 24, 2008. PLUS they have a 10% discount for last minute charters (booked within 21 days before commencement of charter). Fancy a quick getaway? Promenade is available for a last minute charter April 26 to May 3rd 2008 for a 6 or 7-night charter. How great would that be! Otherwise, Promenade is fully booked up through August 10, 2008 but are then open from August 11th to October 25th. There are still cabins available for the BVI Dive Week October 26th through Nov 1st, 2008!!! We have posted Promenade's calendar here to help you with your vacation planning. As you can see, it is not too early to make arrangements for next year. Promenade can take up to 10-12 guests. With their flexible accommodations, lots of toys, and onboard diving instructors, no wonder they book up quickly. You've been warned! Yes, we all had a great time on the Blithe Spirit. Dominique and Michel were wonderful hosts. The boat was great, food wonderful and the BVI's fantastic. We thoroughly enjoyed the entire trip. Dominique and Michel were very attentive without being intrusive. Not knowing what all there was to do, they made excellent suggestions and were great guides. Michel arranged a scuba dive that I will always remember. Michel even tolerated me "helping" setting sail and taking the helm. I felt that if we had wanted to do anything in particular we would have been accommodated but we let them show us the BEVY and were never disappointed. Blithe Spirit is a 52-foot Irwin ketch owned and operated by the French Canadian couple, Michel & Dominique. We love being invited to dinner aboard Blithe Spirit (it's good to be a charter yacht broker living amongst the fleet!) as we enjoy eating their scrumptious food as much as they enjoy creating it. Such warm hospitality, too! I love chocolate mousse and Dominique's is truly wonderful. Michel & Dominique use to have an inn in Quebec that was written up in several cooking and travel magazines... PLUS they also had a cooking program on Canadian TV. Blithe Spirit accommodates a maximum of 4 guests in two cabins. The master cabin is located aft and is the full width of the boat. It is very spacious, has a Queen-sized bed, and ensuite head/shower. The other guest cabin is the forward V-berth which shares the head with the crew. They still have some open dates for this season, so inquire! Looking for a Caribbean summer charter yacht sailing vacation in the Virgin Islands? For more information, contact PARADISE CONNECTIONS: click here! Double Exposure is a 40-foot catamaran that will begin chartering out of the Florida Keys, May 1, 2008. For this summer season, DOUBLE EXPOSURE will be "captain only" (Captain Scott Higgenbotham, formerly of Quicksilver) and this winter, Double Exposure will be offering fully-crewed charters in Florida and the Bahamas with the assistance of Cara as chef/crew. Double Exposure is fully air conditioned and accommodates up to 4 guests in 2 double cabins with shared head. Excellent comments (of course) for a recent charter we had aboard BLITHE SPIRIT. By far this was one of the best vacations we ever went on. Paradise Connections has been great and very helpful throughout the whole process. I have forwarded your website to several people already who would love to go on a similar vacation experience. Hopefully we will be talking to you in the near future as we are definitely going on a sailing adventure again. The whole vacation experience aboard the Blithe Spirit was wonderful and went way beyond our expectations. Being this was the first time we ever went on this type of vacation chartering a boat, we were very novice to the experience. Dominique and Michel were wonderful and by the end of the vacation we all felt like family. 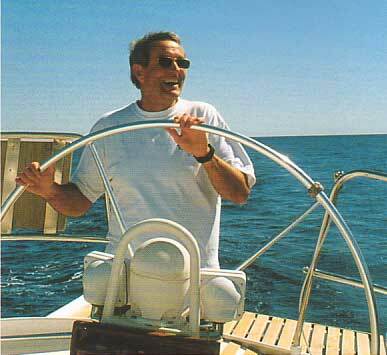 Their extensive experience sailing really let us feel secure that we were in good hands. They also knew exactly where to go and what to see. Michel was the perfect guide and made the sailing, sightseeing, exploring and snorkeling top notch. Our itinerary was perfect. The food was superb and we could not have asked for any improvement. Dominique is a chef extraordinaire. We found ourselves completely losing track of days and time. We were sad to have our vacation come to an end. And this of course is a sign of the perfect escape to paradise. We definitely will go on this type of vacation again. Hopefully we will charter again with Dominique and Michel. We plan to keep in touch and have invited them anytime to visit us in New Hampshire. We have already recommended Blithe Spirit and Paradise Connections to others who also are looking for this perfect vacation experience. SEAS THE MOMENT, a 70-foot Azimut motoryacht, is relocating to Lake Erie for Summer 2008. Seas The Moment will be leaving Fort Lauderdale on May 17, 2008 for Lake Erie. To secure a repositioning charter, her generous owners are offering her at a reduced rate. Normal charter fee is $21,000/wk plus all expenses. UPDATE: Please note that the yacht has repositioned to Lake Erie so the special offer is no longer available. If this seems like an interesting trip, let us know and we'll provide you with more details!